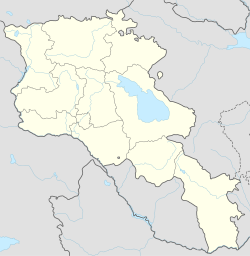 Khndzoresk (Armenian: Խնձորեսկ, pronounced [χəndzɔˈɾɛsk]) is a village and rural community (municipality) in the South-East of Armenia, in the province (marz) of Syunik. The village is located to the right of Goris - Stepanakert highway, on the steep slopes of Khor Dzor (Deep Gorge), from which, according to tradition, it got its name. Crossing the bridge at the entrance of the village, the road continues towards the towns of Lachin and Stepanakert. New Khndzoresk (the current inhabited area) was built in the 1950s. The village is located at 1580m above sea level and occupies 6772,8ha. The National Statistical Service of the Republic of Armenia (ARMSTAT) reported its population as 2,260 in 2010, up from 1,992 at the 2001 census. As of 2009, the population of Khndzoresk comprises 2256, of which 1126 women and 1130 men. There are 516 households in total. About 90% of the population is involved in agriculture (animal husbandry and gardening). There is a small milk processing enterprise, employing 8 people. The community has a number of administrative and public institutions, such as community council, secondary school (with 370 pupils), musical school, kindergarten, library, museum, culture club. In the end of the 19th century Old Khndzoresk was the biggest village of Eastern Armenia. In the beginning of the 20th century the community had 8300 inhabitants (1800 households). In 1913 there were 27 shops, 3 dye-houses, tanneries, 7 schools. The village is famous for taking part in the liberation movement of David Bek. The fortress of Khndzoresk served as a military base for Mkhitar Sparapet in 1728-1730. In 1735 the village was visited by Catholicos (Head of Armenian Apostolic Church) Abraham Kretatsi who gave a thorough description of the community in his chronicles. During the 1980s, an additional village sprouted 7km from Khndzoresk due to resizing and political unrest. This village, considerably smaller than Khndzoresk, is called Lower Khndzoresk, or Nerkin Khndzoresk. Surprisingly, most of the villagers have been found to belong to Y-DNA Haplogroup R1b; specifically to a Western European branch of R-DF27: L754 > L389 > P297 > M269 > L23 > L51 > L52 > L151 > P312 > DF27 > Y3267 > Y7365 > Y28672 > Y7363 > Y41095 > Y41710 > Y42667 (https://yfull.com/tree/R-Y42667/). Origins are being explored in a Y-DNA project with the company FamilyTreeDNA (https://www.familytreedna.com/groups/khndzoresk-dna-project/). Khndzoresk is widely famous for its canyon with picturesque rock formations and ancient cave settlement. The artificial caves, some of which are currently used as stables and warehouses, used to be inhabited till the 1950s. In the bottom of the gorge there is St.Hripsime church, dated back to 17th century. On a spur beyond on the right side of the gorge there is Anapat (hermitage) with the tomb of Mkhitar Sparapet. The cave church of St.Tatevos can also be found nearby. The climate in the community is warm, relatively humid, with mild winters. Annual precipitation is 450-700mm. ^ "Syunik regional e-Governance System" (in Armenian). Syunik Province provincial government. Click on link entitled "Համայնքներ" (community) and search for the place by Armenian name. ^ "Marzes of the Republic of Armenia and Yerevan City in Figures, 2010" (PDF). National Statistical Service of the Republic of Armenia (ARMSTAT). This page was last edited on 11 April 2019, at 23:58 (UTC).